Mission Beach - A great place for all types of buyers! Mission Beach – A great place for all types of buyers! As a buyer you have a wide variety of homes to choose from – condo’s, town homes, duplexes, beach front property (only feet from the sand and boardwalk), rental property and single family homes. In the first 3 months of 2014 there have been 13 detached and attached homes sold with an average purchase price of $1,400,000 in Mission Beach. In 2013 there were a total of 103 properties sold with an average sales price of $1,200,000. Many of the these homes have ocean and bay views, views of downtown San Diego and are only blocks away from the beach. At any given time there will be approximately 35-60 homes available for sale in this area. The average house for sale is a 3 bedroom 2 bath 1,400 sq. ft home priced at $1,500,000 with an average market time of 75 days. So why buy a home in Mission Beach? This great beach community is located within the city limits of San Diego and is bound by the Pacific Ocean to the West; Mission Bay to the East; and Pacific Beach to the North. The North side is more of the resort - hotel part of the community with newer upgraded single family homes, condominiums and town homes. If you are interested in a long term rental, the North part of Mission Beach is where you will find the perfect house. On any given day you can do the following. 1. Go to Belmont Park. Belmont Park is the hub of Mission Beach. You must ride the wooden roller coaster – The Giant Dipper, which is the 2nd oldest wooden coaster in the USA. The park has an arcade with tons of games, rides for kids, a Merry-Go-Round, the very cool Wavehouse surf ride (which creates a simulated wave for people to surf on) and of course great food and places to eat. 2. Walk the beach! One of the best things about Mission Beach and Pacific Beach is that they encompass about 4 miles of beach area including the ocean and bay. 3. Rent a beach cruiser and cruise the boardwalk! 4. Visit Sea World San Diego. 5. Eat at the hundreds of restaurants available to you within a mile of your new home. 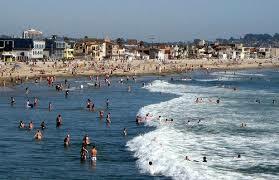 Mission Beach continues to be a location where investors and long term home owners want to live and buy.